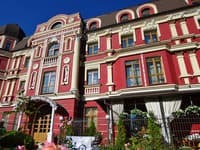 The mini-hotel on Elektrotehnicheskaya St., 18, Kiev (Troyeschina) offers cozy rooms, which have everything a person needs to feel comfortable in a strange city. 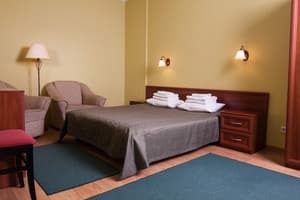 The mini-hotel includes 15 comfortable rooms for 2, 3, 4 guests, and cozy two-room suites, which together makes 50 seats. 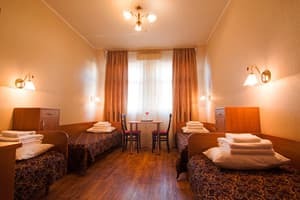 The mini-hotel is ideal for small tourist groups who came to Kiev on a business trip, to a conference and of course just guests. 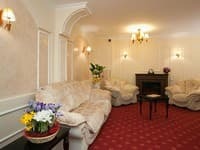 In the mini-hotel guests will be met by experienced staff. 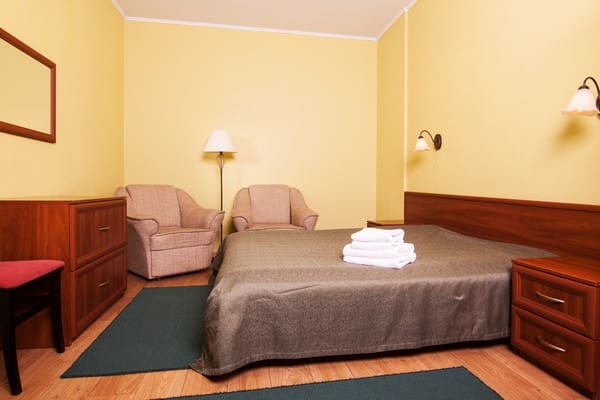 Description of the room: The room area is 23 m2. The room has: 3 beds 80 cm wide, TV, refrigerator, dining table, bedside tables, wardrobe, toilet room with shower, internet wireless. The room is designed for 3 people. 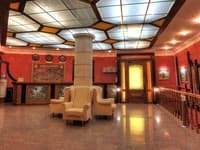 The cost of the room is 800 UAH per day, excluding of the tour. 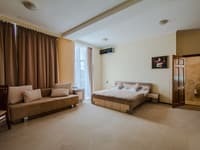 Description of the room: In the room: TV, air conditioning, refrigerator, 5 beds (80х190cm), bedside tables, wardrobe, dining table, 5 chairs, toilet room with shower, bed linen, towels, toiletries, Wi-Fi Internet. A hairdryer, an iron, a kettle, utensils are provided upon request. Paid services: Laundry -1 laundry 80 UAH; Guarded car parking - 25 UAH per day, bus parking - 60 UAH per day; Round-the-clock cafe "Shvarochka" with a large selection of ready-made dishes of Ukrainian and European cuisine. Possible delivery of food to the room. Children under 7 years stay free of charge, without providing a separate bed. Early check-in and late check-out are charged additionally and are half the cost of the room. Settlement with animals is allowed by prior agreement with the administrator, on the conditions of keeping the animal in the room. 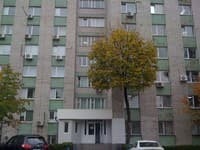 При бронировании заполнял графу особые пожелания, желаемого не получил. Cafe "Shvarochka" - a round-the-clock fast food cafe in the hotel building. 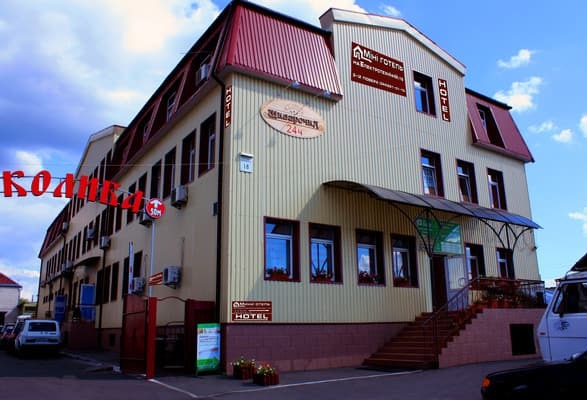 The mini-hotel on Electrotechnical, 18 is located in Kiev in the Desnyansky district (Troeschina), in the wholesale vegetable market 'Farmer` in the new administrative building on the 3rd floor. The center of Kiev is 12 km from the hotel, the Boryspil airport is 32 km away, the central bus station is 18 km, the railway station - 16 km. The nearest st. m. - "Chernigov" (in 15 minutes of driving). From the station "Vokzalnaya" (railway station): to the metro station "Chernigovskaya" and from the metro station "Chernigovskaya" go 15 minutes by shuttle bus number 528 (28) or tram number 28, 35 to the stop "Trade complex" (pass to the wholesale vegetable market). From the metro station "Petrovka" go 15 minutes - shuttle bus number 101 or bus number 101 to the stop "Trade Complex" (go to the wholesale vegetable market). From the Central Bus Station go 40 minutes - shuttle bus number 416 to the stop "st. Zakrevsky "(go to the wholesale vegetable market). From st.M. "Boryspilskaya" go 50 minutes by shuttle bus number 529 to the stop "st. Zakrevsky "(go to the wholesale vegetable market). From the Kiev ring train, station "Troyeshchina-1" minibus taxi No. 61 or bus number 61 to the stop "Trade complex" (go to the wholesale vegetable market).